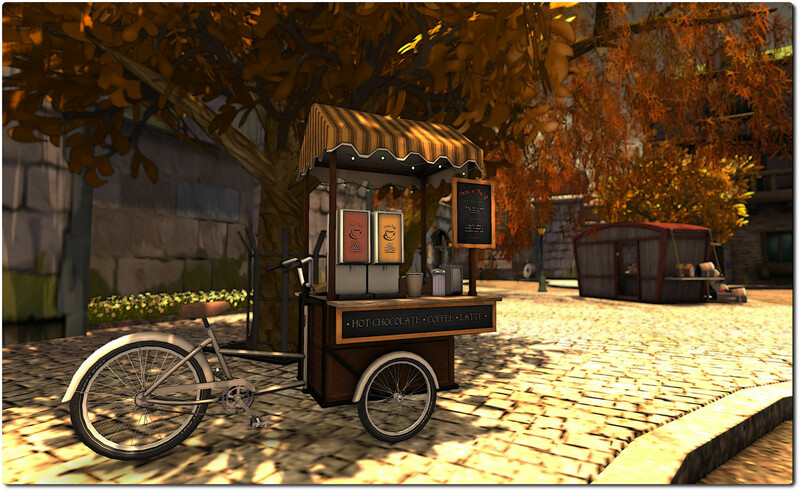 I came across Asa Vordun’s Caprice and Easy A entirely by chance, the happy circumstance of flipping through Flickr and bouncing around Second Life. Call it is case of SL serendipity, as I couldn’t have come across both at a better time, thanks to a number of stresses crowding me somewhat of late. Both shooed those worries away and left me smiling. 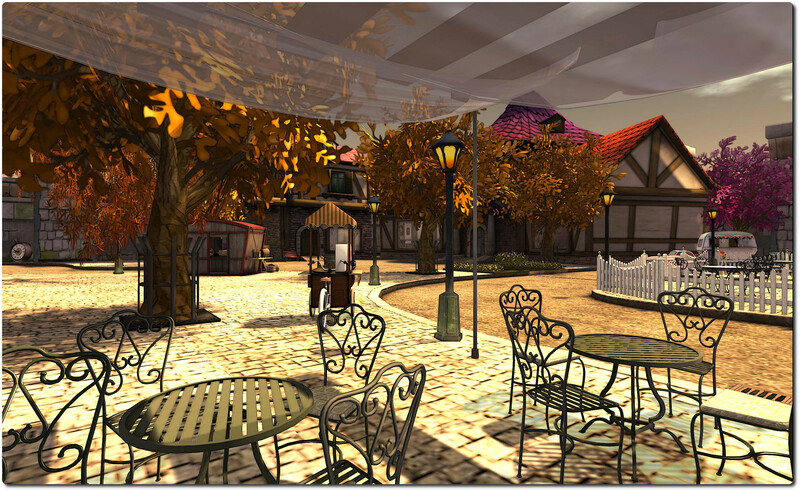 It’s a beautiful little corner of a Second Life, featuring houses by Kayle Matzerath, who provided the fabulous Lumenaria at the 2013 Fantasy Faire, arranged around a small square and fountain. When I first visited, Caprice was enjoying a bright autumn, with the leaves on the trees a golden brown, the air crisp and the sun still warm enough for one to forsake a coat when stepping outdoors. Since then, I gather the time as moved on, and winter is gradually encroaching, the trees now denuded of their foliage and snow drifts laying claim to corners and to the sides of roads. Just as well, then, that a café offering coffee and hot chocolate stands on one side of the square, facing another offering filling snacks and warm drinks over on the other side. Or, if one prefers, apples and hot cider can be had from a wooden stall. This is place where friends can meet and spend time seated around the fountain or at the cafés or – if the weather gets too nippy – inside the delightful library. By day or by night, Caprice offers the warmest of welcomes and its whimsical looks and feel encourage you to tarry and forget the bustle and call of the rest of the grid. From the arch of the arrival point, looking out over a seafront scene with jetty, lighthouse and sail boat, you can meander along the footpaths and the road which catches the square in a paved lasso, wander past the cafés and the library and cider stand until you come to the arch of a narrow tunnel. Here, beside a sign inviting you to breathe, you might want to slip on a coat before continuing through the tunnel and into Easy A. Here is a place where winter has truly arrived. 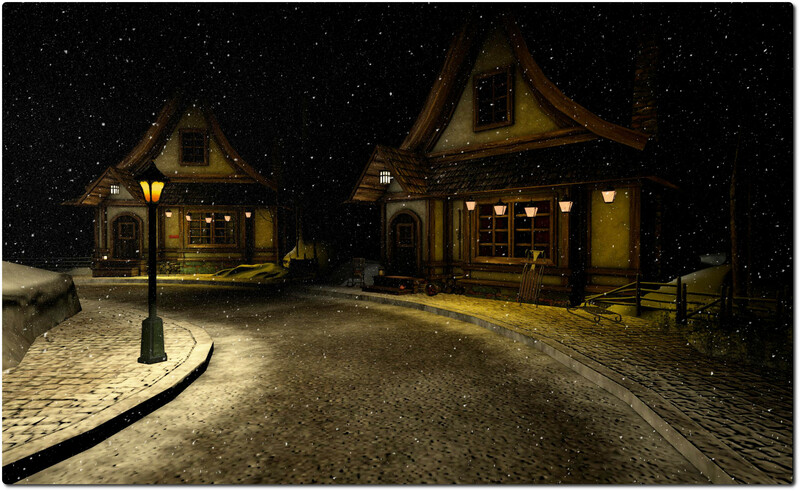 Asa has done a fabulous job in creating a wonderful winter tableau photographers could likely have a lot of fun with – and to really capture the atmosphere, I do suggest you try a night / low lighting level with your time-of-day / windlight. Cottages by Cory Edo and Van Auster sit by the side of a road which circles a high mesa. 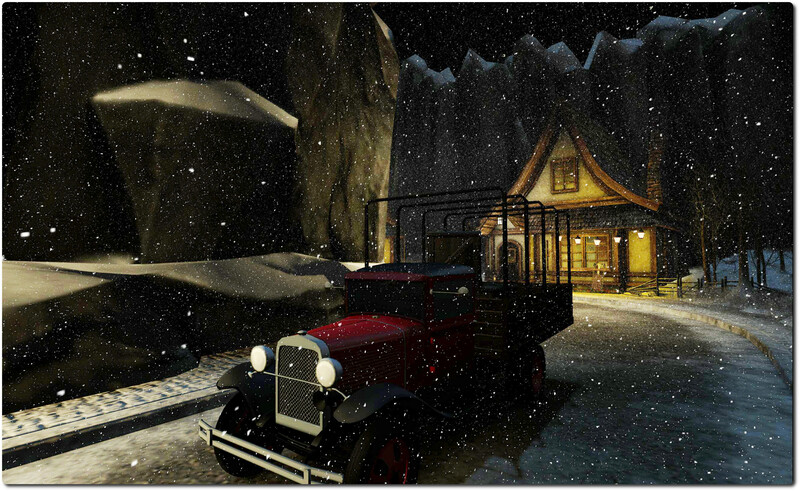 As the snow falls, a lone truck rumbles along the street, passing under the roadside lamps, headlights picking out the road ahead – you can see why I said Easy A needs a night-time setting to really be appreciated :). As with Caprice, the attention to detail here means you’re going to need to keep a sharp eye open to appreciate everything on offer, particularly where the cottages are concerned, each of which offers a place to sit and reflect, or chat. Or if you prefer, you can find your way to the top of the tall pillar of rock, crowned as it is by a ring of fir trees, themselves topped and hung about with lights and which surround a secret place to sit and share while coffee and soup bubble on an open fire. 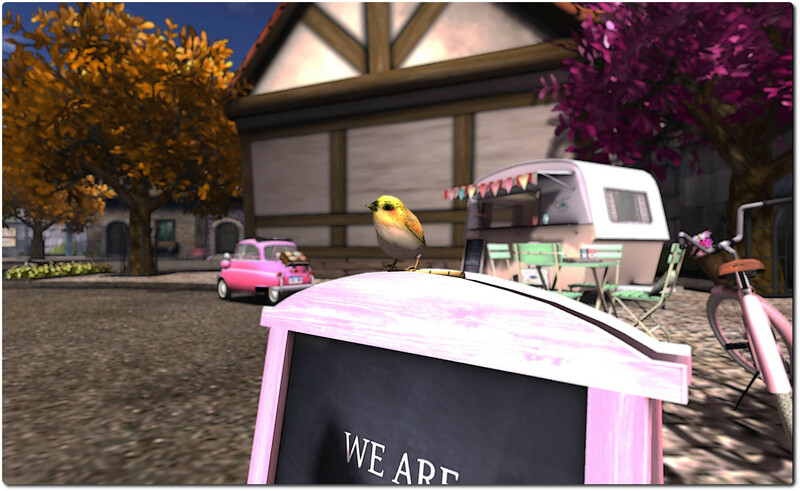 Both Caprice and Easy A offer a small slice of magic well worth taking the time to visit, particularly if you enjoy taking photos in SL. I have no idea as to how frequently Asa giver her parcels a make-over, but I have to admit that outside of changing them to suit the seasons, I rather hope they don’t often go through too drastic an overhaul – at least not Caprice, given that Easy A is a little more in keeping with the onset of winter in the northern hemisphere and so may change more dramatically as the year passes. As it is, both offer charm, warmth (despite the weather :)) and individual beauty to the passing traveller. Be sure not to miss either of them! And as winter is the theme, here’s another piece by Chris de Burgh to mark the time of year.